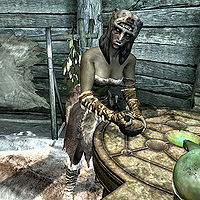 Murbul is an Orc destruction mage and wise woman of Dushnikh Yal, the Orc stronghold southeast of Markarth. She is the mother of Chief Burguk and also functions as the local apothecary, selling a variety of merchandise if you are blood-kin of the orcs. As town elder, Murbul has her own room in Burguk's Longhouse and sleeps there every night between midnight and 8am. After waking up she heads over to her tent and spends the entire day offering her services, at times using the tanning rack or the alchemy lab. At 8pm she was supposed to relax in the longhouse with a book, but doesn't, due to a bug. Instead, she stays in the tent and offers services until midnight. She wears a pair of ragged boots, Forsworn gauntlets, fur armor and a Stormcloak officer helmet. She carries the key to the longhouse and wields a steel or, starting at level six, an Orcish dagger. She also carries a random selection of middle-class items, including food, jewelry and gold. She will only provide limited information but will comment on her wares, saying, "Orc poisons are to be feared, if you wish to trade." or "I have an old cure for Rockjoint. Common in little Orc children." She will also reveal that "I am Burguk's mother and wise woman to our tribe, outlander." Finally, she may have a thing to say about Malacath: "Malacath rewards the strong and punishes the weak." This is the merchandise found in Murbul's merchant chest. These items are only available if purchased from the merchant; they cannot be pickpocketed or stolen. They are restocked every two days. Murbul was supposed to sit down and read in the longhouse between 8pm and midnight but stays frozen in her tent the entire evening, still offering services. She may not give any dialogue options when attempting to speak with her. ?